The vast majority of the Christmas Day game between the Cleveland Cavaliers and Golden State Warriors was just as competitive as fans could have hoped for. The game’s final moments, however, left a bad taste in many viewers’ mouths when the referees failed to call a foul on Kevin Durant as LeBron James drove to the basket. In a postgame interview, James made it clear that he believed he was fouled several times in the final phases of the game. Many who watched the game, including several of his NBA colleagues, seemed to agree with James. Players weren’t the only ones to voice their opinions as many reporters and analysts chimed in about the controversy as well. 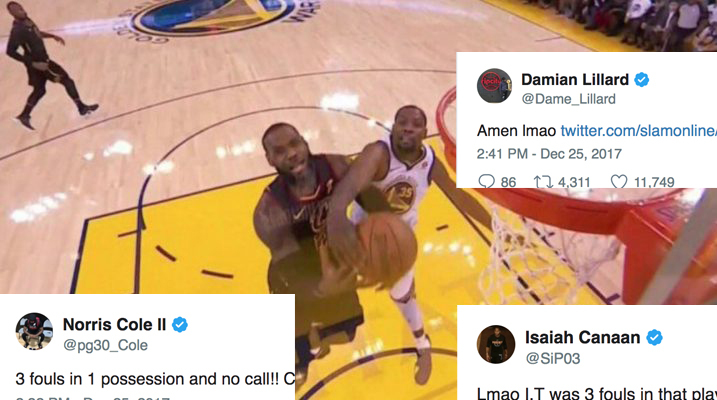 Kevin Durant was fired up AF to get away with two obvious fouls on LeBron James on the same play. KD with three fouls on two LeBron "turnovers" during Cleveland's most critical two possessions of the game. Very trash end to this game. Monday’s defeat is a tough one to swallow considering how huge of a role the no-calls played in the outcome, but it is still just another game in a very long season. James and the Cavs will have an opportunity to get their revenge soon. The Warriors travel to Cleveland on Jan. 15 for yet another rematch of the NBA’s most heated rivalry. Hopefully the refs manage to get it right this time.